Every year, trillions of gallons of rainfall and snowmelt pour into the grasslands of the Northern Great Plains. Much of that water winds up in the Missouri River, where it becomes drinking water for millions of people. But the role the grasslands play in capturing all that liquid is often poorly understood. With grassland temperatures and droughts on the rise, keeping moisture in the soil is a big priority for ranchers and farmers. Returning to more natural ways of managing the landscape—involving less tilling and water loss—is good for both people and wildlife such as pollinators, pronghorn antelope, and plants. 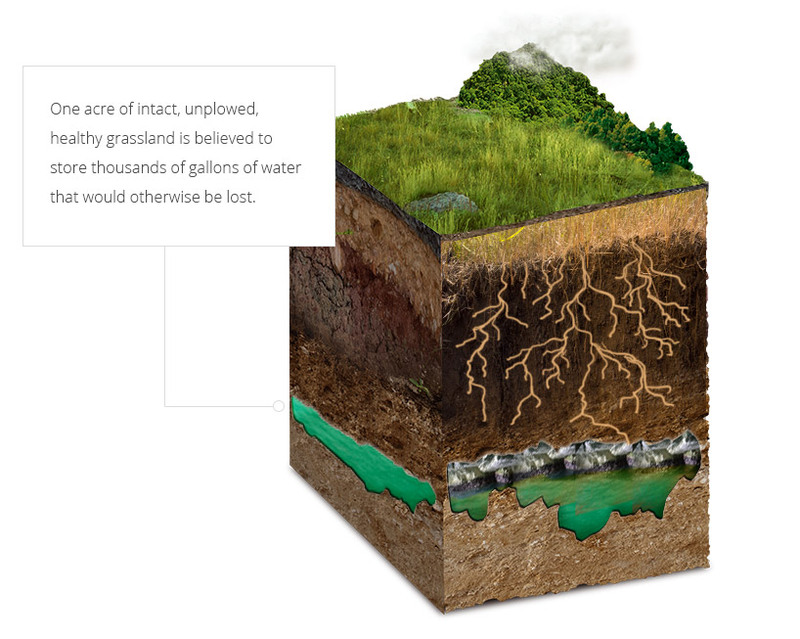 WHAT HAPPENS WHEN GRASSLANDS ARE PLOWED UP? WATER LOSS: Without a thick mat of vegetation to pull moisture into the soil, the soil can’t capture as much water. EMISSIONS: Vast amounts of carbon stored in the root systems of native grasses are released into the atmosphere. HABITAT LOSS: The region’s grassland birds and other wildlife lose critical habitat. Intact grasslands in the Northern Great Plains are rapidly disappearing. In 2014 alone, 1.4 million acres—an area roughly the size of Delaware—were converted into farmland for crops such as corn and soy. How does the rainfall simulator work? A revolving sprinkler head showers water over the soil, simulating rainfall. Within seconds, viewers begin to see how the water moves through different soil types. *Results may vary. Levels shown are for illustration purposes only. Grasslands managed by ranchers on a rotational grazing schedule absorb more water, and tend to have a wider variety of grasses. Additionally, when cattle graze, their hooves make indentations in the soil that help water travel deep into the roots of grasses, where it can be stored for droughts and seasonal dry periods. More than 75% of the Northern Great Plains is privately owned. Many of those landowners are ranchers who require intact, healthy grasslands to maintain their livelihoods. WWF is building partnerships with the region’s ranchers to help them find more sustainable—and more profitable—ways to produce their livestock.